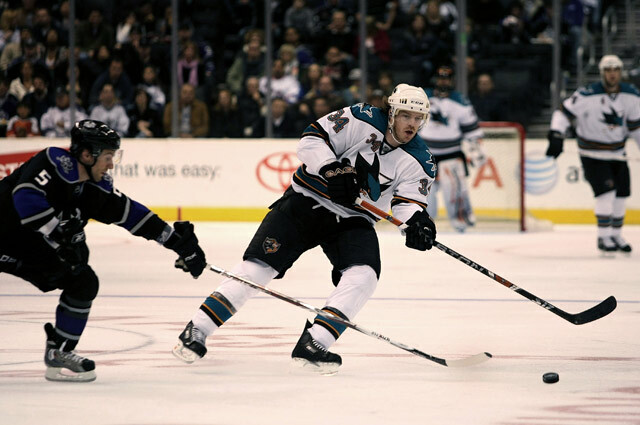 LOS ANGELES (AP) -The Los Angeles Kings became the latest piece of road kill for the San Jose Sharks. Brian Boucher stopped 29 shots for his second victory in two starts with the Pacific Division leaders, who won their ninth straight away from home and got goals from Joe Thornton and Patrick Rismiller in a 2-1 victory over the cellar-dwelling Kings on Tuesday night. Boucher, who spent most of this season with the AHL's Philadelphia Phantoms before signing with San Jose as a free agent on Feb. 26, beat St. Louis 2-0 on March 1 in his only other start with the Sharks. Evgeni Nabokov has started in net for all but three games for them this season, and will be back between the pipes Wednesday night against Minnesota. "These back-to-back games, with the travel that we've had, it's huge to have the confidence that we have in Boosh," said coach Ron Wilson, whose team was outshot 10-1 in the third period. "He did a great job, especially at the end." Boucher, who had five consecutive shutouts with the Philadelphia Flyers in 2003-04, was 4:47 away from his 15th career shutout when Lubomir Visnovsky used Milan Michalek as a screen and beat the goalie high to the glove side with a slap shot from the top of the left circle. The Kings nearly tied it, but Boucher got a piece of Michael Cammalleri's short wrist shot with 9 seconds remaining after the Kings' forward carried the puck down the slot and made a sensational move to get past defenseman Brian Campbell. "You just take it day-by-day, work hard in practice and try your best to stay sharp so that when you get the call, you know you put the work in and left nothing to chance," Boucher said. In a matchup between the NHL's second-worst power play and the league's second-best penalty-killing unit, the Kings were 0-for-4 with the man advantage. The Sharks were penalized twice for goaltender interference in a 3:49 span of the second period, with Patrick Mitchell and Devin Setoguchi taking turns in the penalty box after jostling Dan Cloutier. "There were a couple of nefarious penalties tonight - Cloutier did a great job of drawing a couple of penalties that weren't. But we did a good job of killing them off," Wilson said. Cloutier felt both penalties were warranted. "They're the type of team that shoots the puck and crashes for rebounds," he said. "I expected them to be in my crease and on top of me. That's why they're such a successful team. After a while, I stuck up for myself. I've done that throughout my career. It doesn't get me off my game, it just gets me involved." Los Angeles is at the bottom of the NHL standings with 62 points, four behind Tampa Bay with eight games left - although the Lightning have two games in hand. The only time the Kings finished a season with the league's worst record was in 1969-70. They ended up last in their division six times, most recently in 1998-99. Thornton opened the scoring at 17:09 of the first period while Matt Ellis was off for hooking Patrick Marleau, and reached the 20-goal mark for the eighth straight season. "Our power play has been struggling a little bit lately, so it was nice to get one in the first period," Thornton said. Rissmiller made it 2-0 at 16:23 of the second period, converting his own rebound to end a 16-game goal drought. He is one of 16 different players to score goals during this 13-game surge that had put them within five points of Detroit for the NHL's best overall record. "It's just kind of the nature of our team," Rissmiller said. "You can't rely on the top two lines all the time, so it's nice when you get a couple of other guys chipping in. That's what makes team's successful, and I think that's helped us in our run here." The Sharks, whose franchise-record 11-game winning streak ended with Sunday's 2-1 shootout loss at home against Edmonton, improved to a league-best 26-8-3 on the road - including all three appearances at Staples Center. They are one victory shy of the club record for consecutive road wins, which they set in December. Notes: The Kings have scored two goals or less in eight of their last nine games. ... The visiting team has won each of the first six meetings this season. The series is tied at 3-all, with a home-and-home set coming up on April 1-3. ... San Jose was 0-for-2 on the power play. The Kings haven't been short-handed more than four times in 13 consecutive games, and 21 of their last 23. Opposing teams were 1-for-30 on the power play over the previous nine contests. ... 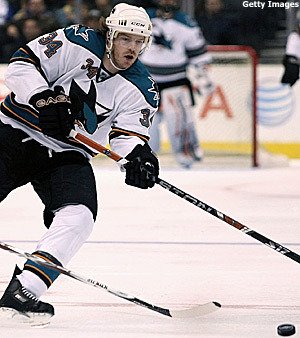 Sharks C Jeremy Roenick, who was a healthy scratch, needs one goal to tie Hall of Famer Jean Beliveau for 36th place on the career list at 507.